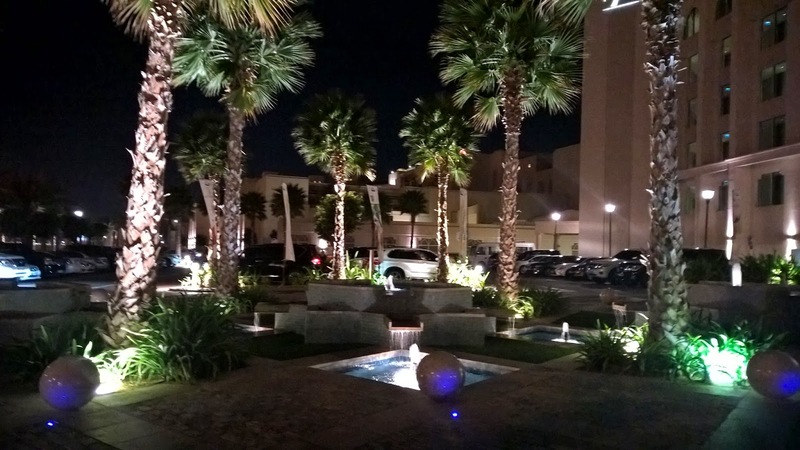 We have some amazing high end dining choices for Indian cuisine in Abu Dhabi. And these do not come cheaply. Then of course we have some lower and middle range options. 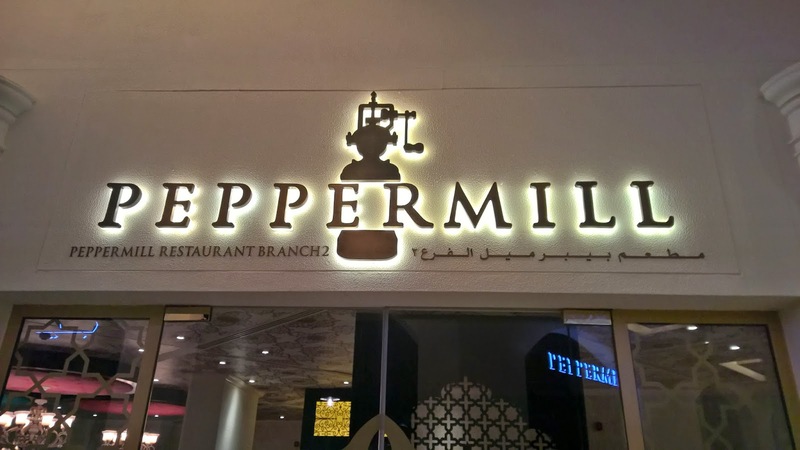 I recently visited Peppermill, a restaurant that specialises in Colonial Indian cuisine, and found that Peppermill places itself right in between those high end and mid-range restaurants. Here are three reasons I would gladly go back to Peppermill, and again. 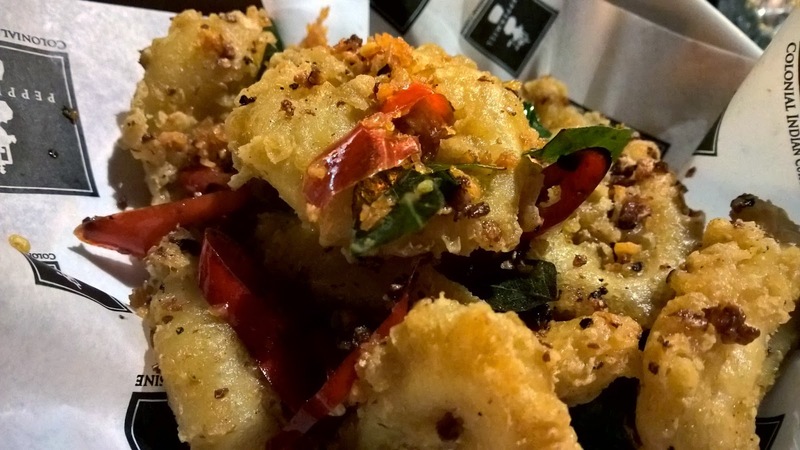 While there are two other restaurants, one in Abu Dhabi's Al Wahda mall extension and one in Al Barsha in Dubai, this Peppermill has an enviable location at the Promenade at Eastern mangroves. The idea of eating very affordable but quality Indian food in such a nice location makes it a very alluring restaurant. When one visits restaurants, one can be fortunate to have the head waiter or captain, thus ensuring great and near flawless service. This often does not extend to other waiters though. However at Peppermill, I was served by three different waiters through the evening. Their service was timely, intuitive and engaging - all three of them. When I pointed this out to one of the waiters, he matter-of-factly mentioned that there were still so many other waiters I have not had the pleasure of interacting with. Firstly, you simply have to order the Mulligatawny soup. The gorgeous yellow colour from the saffron makes it so attractive - yes, we eat with our eyes. There is a chicken and rice lump in the middle of the soup. Yum. Have a bit of that with every scoop of the soup. It makes the soup not only tasty, but gives it a textural supremacy and makes it a filling soup at the same time. For a light snack, the Karare paalak chaat is a snack of which you will want more. 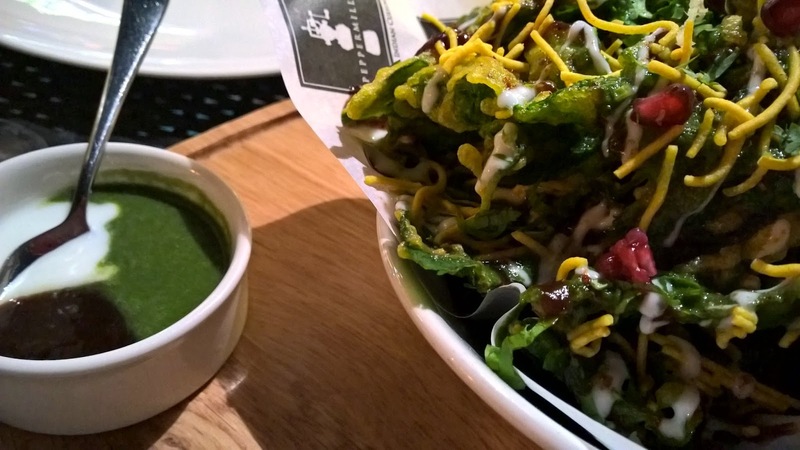 Imagine batter friend, crispy spinach leaves with sprinklings of mint, yogurt and tamarind sauce. The crunch of the spinach blended with that sauce makes it simple but very flavourful. The lamb biryani, or Lamb rogan josh was my dish of the night. 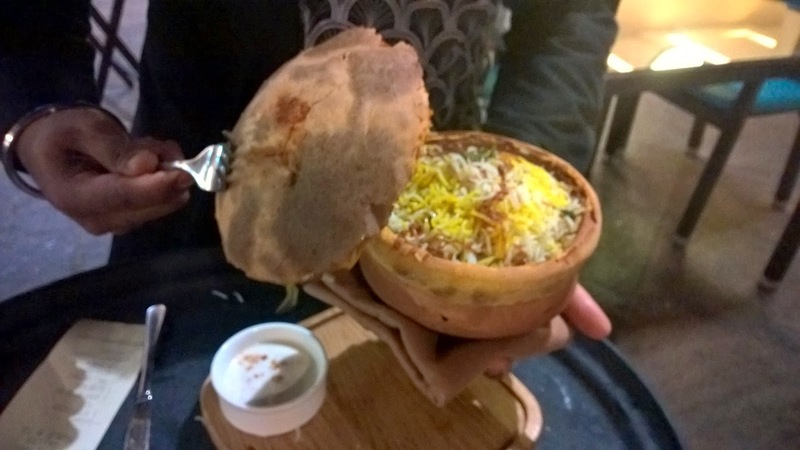 This dish, that is extremely popular in the Kashmiri region, is served in a clay pot with bread as a lid that traps the flavour in a unique way. Confused? 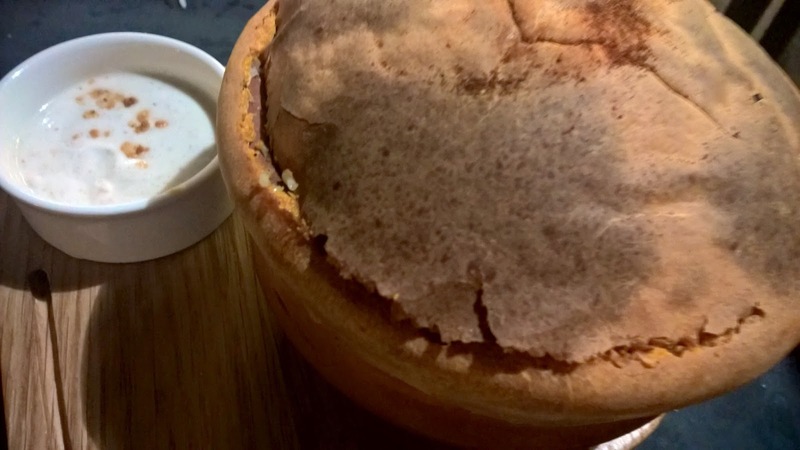 The dish is prepared in a clay pot. It is then covered with dough and placed in the oven. As the name 'rogan' suggests, it has a beautiful reddish colour. It is served with yogurt which balances that spiciness perfectly. Finally, my daughter requested Butter chicken. Very often when one requests butter chicken to be mild, all the flavours are lost, but this dish still had those spicy elements without overwhelming my 8 year old. To sum up, Peppermill is a very viable alternative to more expensive high end options. While I love some of those restaurants, sometimes one just wants to relax while still having excellent dishes. That is where Peppermill does so well. Furthermore, with main courses priced between 42-47AED, you are getting an all round good experience.